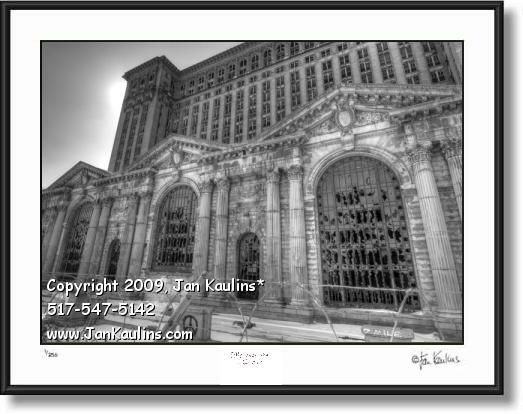 MICHIGAN CENTRAL TRAIN STATION black and white Detroit print photo art print photography for sale. This black and white old MICHIGAN CENTRAL TRAIN STATION DEPOT Detroit photo print art photography for sale is MADE FROM NINE MULTIPLE BRACKETED EXPOSURES. It is an excellent artistic portrait of the remains of one of the grandest structures in Detroit. At the top left corner of the Michigan Central Depot you can see the white partial sillhouette of the sun coming up in the morning. This MULTIPLE EXPOSURE artistic orginal signed and numbered Limited Edition photo is made using nine seperate bracketed exposures which then are layered and artistically interpreted to create this original HDR work of art.